Two-bedroom homes with a staircase horizontally dividing the living room and dining room. Three-bedroom semis with a staircase running vertically against the common wall. Our house is the 3-bedroom common wall version. During a renovation, most people with this type of layout will take down the wall between the kitchen and dining room and open up the main floor of the house completely. This creates an open, airy, light-filled main floor. Our master bedroom duct ran through the wall. We would’ve had to reposition our vent and open further walls to re-route the duct. This would've cost over $1200. The plumbing, including toilet stack, is in the wall. This would’ve been a major plumbing expense to move. (Approximately $3000). The existing toilet drain is cast iron and great for dampening the flushing sound. These days, a PVC pipe would be used, which is noisy. We also like the traditional feel of separate rooms. The downside to open concept is that the home can lose some of it’s traditional, homey feel. But the most important reason was to save lots of time and money! You have to weigh the pros and cons of each renovation you do to your home. Is the major time and expense of knocking down this wall going to pay off in the end? In this case, we felt it wasn’t worth it. I tackled the kitchen layout based on the existing location of the sink, dishwasher drain, hot/cold water lines, gas line position, receptacle/light location, vent location, window and door openings. My years of experience as a general contractor came in handy in the planning stage. My wife, Lia, designed the kitchen based on my practical specifications and limitations. We went with Laxarby Ikea cabinets. They offer affordable, quality cabinets and their website offers a good online program to lay out and price your kitchen. Lia decided that avoiding upper cabinets would make our kitchen feel bigger and brighter; and it feels so much bigger and lighter than it did when we bought it. We added a floor-to-ceiling pantry that took care of the storage we lost with our previous uppers. 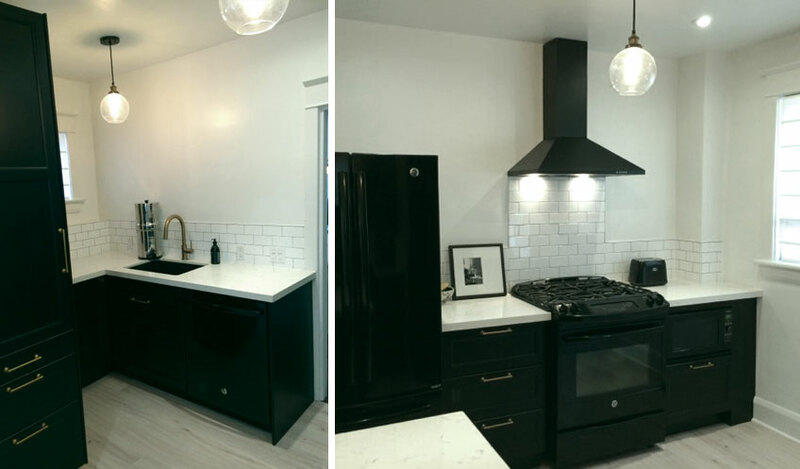 We went with a classic look: black cabinets with brass accents and white quartz countertops. She picked black appliances, sink and drain. We went with light laminate flooring (to save even more money) and a white subway tile backsplash with dark grout to keeps things bright, yet traditional with a modern feel. We definitely did not want a kitchen that was going to go out of style in a few years. We added a black range hood cover and changed the range to gas. (The gas line was directly below the existing range location). I’ve found that most buyers are interested in gas ranges. Our weird 24“ electrical range (what Lia referred to as the ‘easy bake oven’) was changed to a standard, full size oven. All of our appliances were purchased in one shot at Canadian Appliance Source and we negotiated a great deal. I planned to make sure all of the receptacles, lighting and sink/dishwasher drains didn’t have to move, which kept the cost down. We added a few pot lights and two decorative lights. Most people really go overboard with pot lights, therefore adding more cost and time than is needed. We only put in 4 pot lights (which we rarely turn on) and two glass, pendant lights, with retro yellow light bulbs, which give it a warmer look and feel. $15,000 which resulted in an increase in the value of our home by more than $50,000. We saved $12,000 by NOT knocking down the wall. The faucet. You don’t want to end up with a leaky, broken faucet in a year. Buy a quality faucet. Knobs and Pulls. 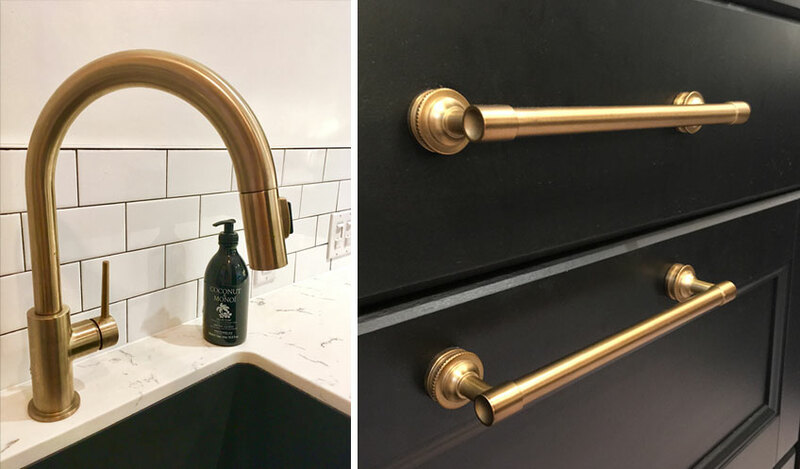 Spending a little extra on hardware can make a huge difference in how the kitchen looks. Invest in quartz. It’s durable, sanitary and it goes a long way in making your new kitchen look great. 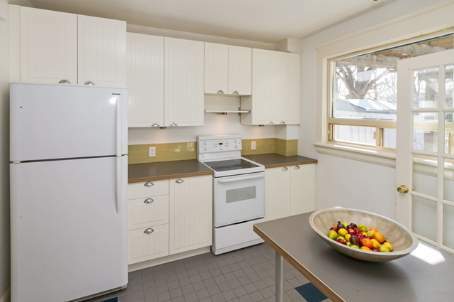 Our kitchen renovation added $50,000 or more in value to our home and we only put in $15,000. If you're willing to spend the time and money on buying a home that needs some renovation, you can really save a lot of money. If you're looking to buy a home in the GTA that needs some fixing, why not take a realtor with years of general contracting experience with you?